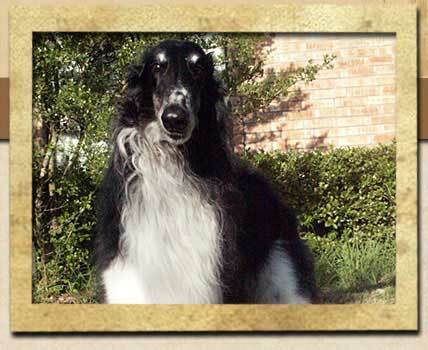 Nigel was the fulfillment of another of my dreams - to own a black or predominately black borzoi. When picking up his half-sister Tassja from breeder Sara Whittington (Chataqua), I was shown a new litter, three days old. I stared at the tiny black ball wriggling next to his mother and promptly informed Sara that if the little pup grew to be show quality, I would happily provide him with a home. I was ecstatic when I was informed a few months later that he would be mine. At eleven months he earned his first point in the conformation ring. While awaiting a little bit more maturity he was introduced to lure coursing. He easily achieved his Junior Courser title over a weekend, and his first time out running with other dogs got back-to-back Best of Breeds for the weekend, one of them a four point major. A couple of weeks later, he earned a Best in Field (which gave him his second major)! He received his AKC Field Championship in six trials with five Best of Breeds and one Best in Field. On October 25, 1998, at the age of two and a half years, Nigel completed his AKC conformation championship. He was completely owner handled. 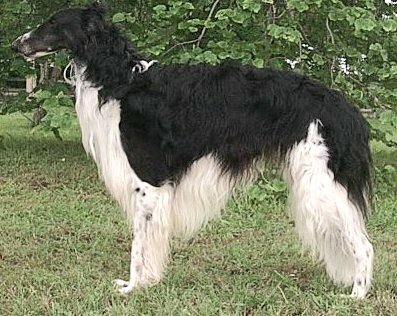 In 2004, Nigel received the title of ROM-C, a Register of Merit Award based on requirements set forth by the Borzoi Club of America. Sadly, Nigel passed away unexpectedly on November 18, 2004 after a brief illness. 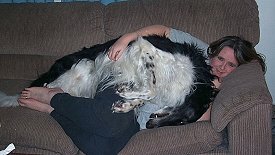 His presence is deeply missed and a great part of myself feels so empty now that my "shadow" is gone. There are not enough words to express my sorrow. Victor and I cherish his children and grandchildren.